After three years of work, the EU-funded UrbanWINS project will come to an end this May. During its life time, UrbanWINS has developed and tested methods for designing and implementing eco-innovative strategic plans for waste prevention and management in eight pilot cities: Cremona, Albano Laziale, Pomezia and Torino (Italy); Leiria (Portugal); Bucharest (Romania), and Manresa & Sabadell (Spain). Now, it is time to share the outcomes and results of the project so that other cities, organisations and stakeholders can build upon them. 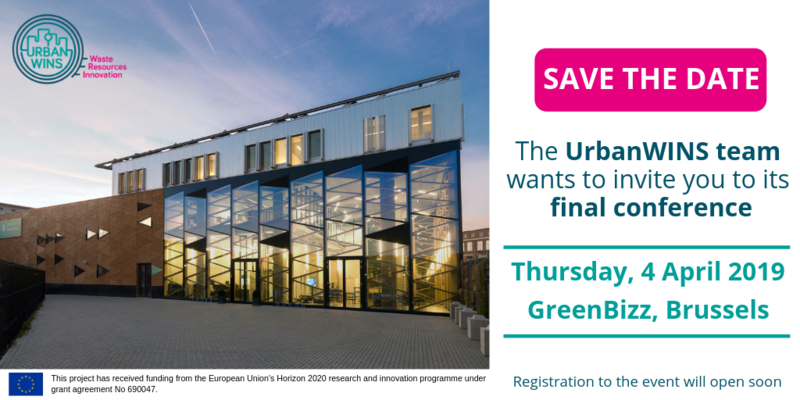 Come and join us in our final conference, taking place in GreenBizz, an environmental incubator in Brussels. Looking forward to seeing you there! Participation in this one-day event is free. Register here. Registration is open until March 25th.